Current Status: Formed by the merger of Adelphi and Noddle's Island Lodges on 06/12/1982 (1982-32). In Grand Lodge Vault; merged into Moses Michael Hays Lodge, 08/14/2003 (2003-93). 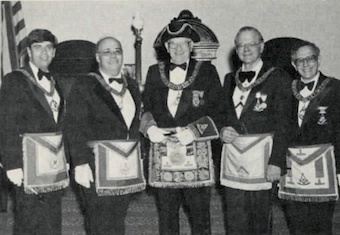 A most enjoyable evening was held in the Watertown Masonic Temple on June 28 when Adelphi-Noddle's Island Lodge received M. W. David B. Richardson, Grand Master, and a distinguished suite. The occasion marked the presentation of citations for special services. Brothers Jean Sisson and Sumner Sturman were recognized for their willingness to fill the vacant chairs whenever called upon; Wor. Harold Schwartz, Wor. Bernard Wein-rebe, and Bro. Joseph Weinrebe for long services as "Repast Caterers" (kitchen crew). M. W. David B. Richardson, Grand Master; Wor. 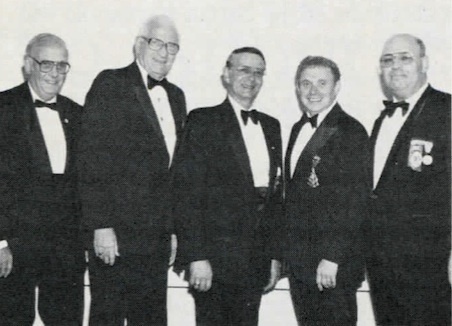 Myron C. Margolin, Master of the Lodge, and Wor. Jack L. Zimmerman. The smiling faces of the assembled Masons last June 26 go far in telling the story of the exceptional "triple-header" which was shared by the officers, members, and guests who attended the Testimonial Night and Past Masters' Night in Adelphi-Noddle's Island Lodge of Watertown. First was the Testimonial honoring Illustrious Potentate Ralph S. Cohen of Aleppo Temple culminating with the presentation of a check to be donated to the Shriners Burns Institute of Boston. Three speakers extolled the virtues of R. W. Bro. Cohen whose meteoric climb to the top rank in Aleppo placed him in charge of some 13,000 Shrine Masons for the year. The speakers in the persons of R. W. James C. Sirios, M. W. Donald W Vose, and M. W. David B. Richardson, Grand Master, were a highlight of a well-attended evening. The second event was the Honorary Membership bestowed on the Grand Master and on M.W. Bro. J. Philip Berquist, junior Past Grand Master, at which time the Grand Master honored the Lodge Master with a Certificate of Meritorious Service, and presented a 25-year medal to Wor. Ira Smith, a Past Master of three Masonic Lodges. The third event was the Past Masters' Night at which Bro. Henry Abrams Woolf was Raised to the Sublime Degree of Master Mason. Wor. Myron C. Margolin served as chairman of the program. This page was last modified on 28 August 2018, at 14:09. This page has been accessed 5,854 times.